For me it’s a perpetually weird experience to work for months in preparation for an election then not be involved in the election itself… it’s like helping organize a party then not turning up! So I was sincerely delighted when we were awarded the contract to cover actuality filming for the AEC immediately before, during and after this Federal election, for future training and general comms purposes. This work has seen me in the Hunter Valley and the desert north of Mt Isa before Election Day, and will see me shooting in Nowra, the Sydney Dec Exchange and Hunter several times afterwards. But, for now, here’s my adventures on the big day itself. DAWN: Wake in Canberra 500m from Parliament, having happily scored the very last room in the historic Kurrajong Hotel. Its soon to be gutted and redone as a probably-painfully-generic corporate hotel, but for now it’s a rather wonderful daggy time capsule, smelling faintly of low-rent, seedy political intrigue from ages past. Not many other hotels have witnessed the death of a Prime Minister; but this town of course has witnessed the ex officio equivalent many times… and today is looking particularly ominous! But I’m getting ahead of myself. 7:45am: Reccie to Canberra’s cool Museum of Democracy, a really great use of the old Parliament Buildings, and now a popular tourist attraction which bring throngs of school children from across the country in a rather heart-warming example of practical civics education. Today the museum and the AEC have collaborated to put a polling place here, and by the looks of the queues, it’ll be a very popular voting option. Polling place opens and is looking great; very by-the-book setup, crisp setup, on-to-it managers. 10:00am Film the rapidly expanding crowd and voting operations. As always, Aussie voting is far more of a carnival scene than I grew up with in New Zealand (where parties are required to be near-invisible of election day), with dozens of party workers handing out how-to-vote cards and trying not-quite convincingly to strike the pose of hardened operatives. Numerous other (perhaps savvier?) groups take the opportunity to raise hard cash; the ABC is even running a nationwide rate-your-polling-place-sausages website, with many delightful moments of pure Australiana winningly described. I’ve come to rather enjoy this whole scene, which if nothing else gets people involved, and creates a practical, visible function for party members and supporters. Seems good for the health of democracy. 11:00am The museum is absolutely thronged now. 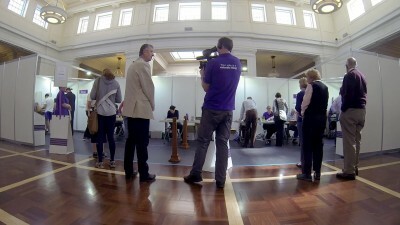 I film AEC Commissioner Ed Killesteyn chatting with people and voting, and get a quick, very good interview with him about this event’s meaning to Australia. What a great place to do it. He points out that a million people an hour are voting today, in the biggest peace-time logistical event Australia undertakes. Crickey. 11:30am Off for a quick good-news-story interview at the local Returning Office which I caught wind of yesterday, where RO Lynette London is able to show a ballot box retrieved complete with a wedding ring still inside. 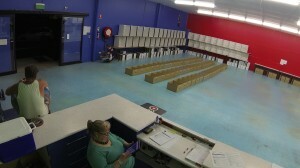 A surprisingly not-uncommon scenario has occasionally tempted staff to “helpfully” open the sealed box to retrieve it, and thereby potentially force the other votes in it to have to be disqualified. It’s an issue we pounded pretty hard in the pre-poll training film, so it’s great to see this one is wrapped in incident tape with the situation described in texter all over it; great improvisation, and a very good catch by the OIC. 1:00pm Driving for a few hours now to Nowra, NSW South Coast, with a couple of rural polling place stops along the way to shoot varied Australia-votes imagery for future purposes. And, short of Merv Hughes in budgie-smugglers, what could be more Australian than the Kangaroo Valley Voting Centre? 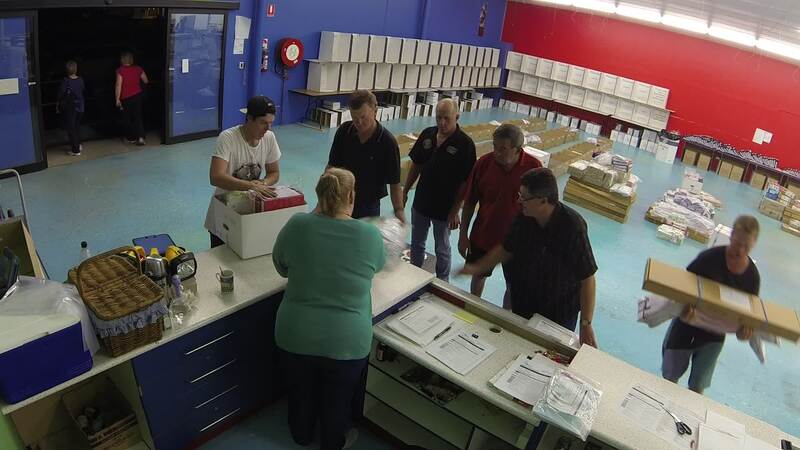 6:00pm At the Nowra returning office now, shooting preparations for receiving returned supplies, then the redoubtable crew taking first results phone calls. Just after 6pm they actually suffer that cliched training scenario of a polling place loosing all power just as the count gets underway, plunging it into darkness. Everyone deals with it calmly and in great humor, sending a truck to help shift everything elsewhere to continue the count. Great stuff! 8:30pm Move down the street to the abandoned toy shop being used for the receipt of supplies and counts. This environment seems to insist on some metaphorical interpretation, but I can’t quite peg it down (?!). The receipt operation is run with fearful efficiency by one local family who on most days run the garage next door… the young men literally run to unload arriving vehicles, the checking is thorough and insistent, and the organisation of supplies once received is impeccable… truly, an impressive scene, run like V8-powered clockwork. It’s a huge division though, so they’re taking a while to turn up… reminds me of a fire station waiting for the big one. 9:00pm Meet the division trainer George Windsor, who has been working for the AEC for a cheeky FIFTY YEARS (!). He very winningly claims that the training films this year were the best he’s seen and very well received… so that’s nice! 10:30pm Someone mentions there’s a new government… but as ever on election night, it’s of only glancing interest and little relevance to the huge task at hand. 11:30pm Whew, and that’s enough from me for today… gotta be back at 9 after all! I’m not as tough as all these Aussies of course, but then again… ummm… All Blacks or something? Sheesh. Anyway, good day!